Selling at JBF - Easy as 1, 2, 3! There's cash in your closets - clean out your kids' closets and turn their gently used items into extra cash for some family fun! Then get started by registering to consign at our next event! Clean out and cash in! Scroll down below for ALL the information you need to collect, prep and tag your items and maximize your Consignor check! You drop off your items, shop EARLY at our Presale, and watch your Consignor earnings grow in REAL TIME! Consignor checks will be mailed out 2 weeks later! Our Average JBF Consignor Check is $300-350! All JBF Everett/Monroe Consignors receive 60% on their sold items less a $12 Consignor Fee per event deducted from your final Consignor check. Consignors who are able to help during the sale for at least 4 hours earn 70%. The $12 fee is waived for consignors who help for 8 or more hours. All Consignors get to shop early at both our Tuesday Presale and Thursday 1/2 Price Presale Events (passes handed out during Consignor Drop-off). All items without a star AND pre-printed with a “D” for donate will be sold at 75% off to the Public on Saturday. No minimum requirement or maximum restrictions on the number of items you bring in, and items can be entered 24/7 using the online tagging system up until drop-off. All clothing & accessory items must be clean - no stains, pilling, odors, excessive wear or tears. Shoe soles must be in very good condition without holes or excessive wear and minimal stains/scuffing on the upper part of the shoe. All non-clothing items (i.e. toys, gear, equipment, furniture, accessories, etc.) must be cleaned/wiped down, in proper working order with all parts and working batteries (if applicable). Please also check items for recalls. If there is an active recall on the item, then it must have the recall kit included in order to be sold. 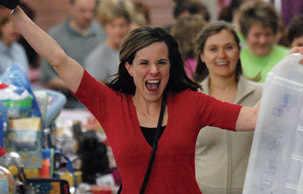 When each Consignor helps out just a little bit, it creates an amazing community event for everyone! Come Join Our Team...It's a lot of fun! The online Team Member Scheduler will open in December! TIP#1: If you can't help out yourself, sign up for a shift and have a family/friend fulfill it for you. Make sure they Sign In/Out using your Consignor #. TIP#2: *BONUS shifts allow you to earn credit for more hours then you actually help out, earning you Team Member benefits quickly. NOTE: Only Consignors (or person helping a Consignor) can serve as Team Members/Helpers. Regular Consignor Drop-off is scheduled for Monday September 9th between 1pm-8pm at the Evergreen State Fairgrounds Commercial Bldg. 1. 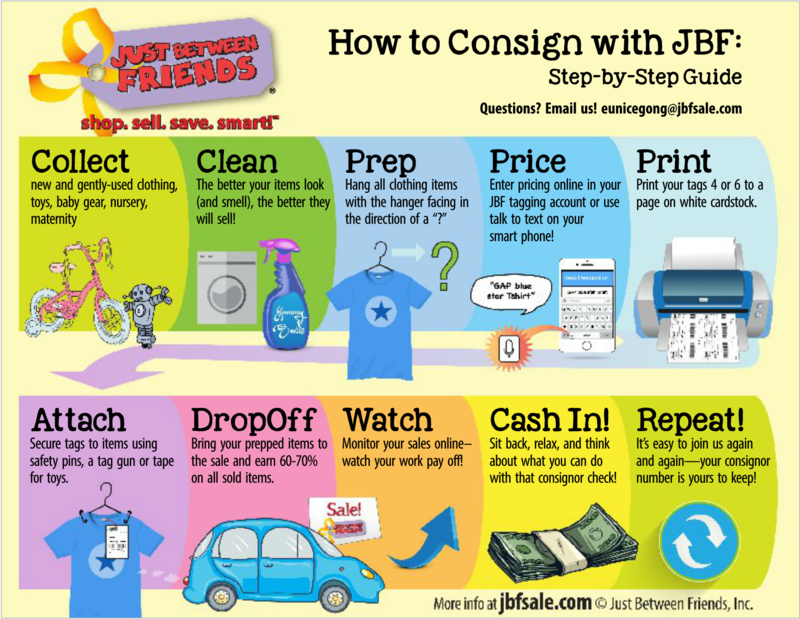 Please Pre fill out our ONLINE ONLY JBF Everett-Monroe Consignor Agreement & Liability Waiver. Please also Sign up for a drop off time at the same time as well. 2. Please bring one tagged item, your Eventbrite Consignor Registration printed or from your phone if needed you can tell us your name at the door to check you in. You will also need two (2) copies each of the Crib Checklist and/or Car Seat Checklist (if applicable) with you up to the Check-in Table at the front entrance BEFORE unloading your items. 3. Once you have checked-in you will be able to unload your items and start bringing them inside. We have rolling racks available to borrow, but if you have your own dolly or rolling racks then please bring it with you to expedite Drop-off. Expect Drop-off to take approximately 30-60min depending on the number of items you are bringing into the Event. 4. NEW: We will be doing a Drop Zone for Inspecting Clothes, shoes will be inspected at our large Item Inspection Area and all battery-operated toys/electronic devices will be inspected in the toy drop off zone. Please have your Books, Shoes and Battery-operated items separated out from the rest of your items in boxes or bags this will help drop off go much faster. Bring in your very best shoes and make sure that all of your battery-operated toys/electronic devices have working batteries in them so that our Shoppers can be assured that they are in working order before purchasing them. 5. Are you DONATING AND REDUCING ALL your items? Then FREE Express Drop-off is the thing for you. BY APPT ONLY on Monday September 9th from 4p-8p. You will be able to sign up for a time when you fill out your waiver. All you do is drop off your items, pre-tagged and sorted by gender then size for hanging clothing items or by type for non-hanging clothing items (i.e. shoes, toys, etc). Have all items placed in disposable boxes or bags as we will not be able to return them to you. We will inspect and place everything on the floor for you. 6. Didn't quite finish all the tagging you wanted by regular Drop-off? No worries, we will have a 2nd Consignor Drop-off on Wednesday, September 11th from 5p-7p for those of you dropping off for the first time or wanting to add to what they've already dropped off. The process will be the same as for Regular Consignor Drop-off described above ALL items will need to be inspected before they can go out onto the floor. Consignor Pick-up is scheduled, Sunday, March 10th between 2p-4p at the Evergreen State Fairgrounds Commercial Bldg. 1. Bring your boxes, bins, bags, etc. along with the Consignor Pick-up Form (same form given to you during Drop-off) to the Check-in desk. NOTE: If someone else will be picking up your items, please make sure you've noted the name of the person who will be picking up on the Consignor Pick-up Form, then sign and give it to that person to bring during Pick-up. 2. After you check-in, you will be escorted by a Team Member to pick up your items. Please inspect your items before you pack them up. If you find any items that are not yours, then please give it back to a Team Member so we can get it back to the appropriate Consignor. 3. Once you have packed up your items, please check the Lost & Found and High Value Areas (if you submitted something at Drop-off). Then, bring your Items to the Check-out area and turn in your Consignor Pick-up Form. 4. You may still donate any items that did not sell. Please place all items you wish to donate in the Charity Donation Area. 5. Pick up hangers as well (while supplies last). 6. Any items not picked up by 4:01pm will be donated (no exceptions) as we have a strict deadline to be out of the building. Gather hangers (plastic preferred but wire accepted), tape (clear packing, painter's tape and Scotch tapes), Ziploc bags, safety pins, tagging gun & barbs, zip ties, rubber bands, ribbon, etc. and watch the How to Tag video series before you start tagging. Follow the 3 C's Rule - Clean, Current, Complete. Ask yourself, is your item clean and without stains or damage, of current style, and complete with no missing parts or flaws? Inspecting clothes for stains works best under unnatural lighting esp fluorescent lights as natural lighting tends to hide stains. We will not accept any stains or damage, no matter how small! Smell your items as well - strong smoke or musty smells from being stored too long will not be accepted. You will need to launder your items before bringing them in. Check out the Safety & Recalls Tool below for a list of recalled items and a Recall Finder link. If your items is listed as recalled, please check to see what is needed to rectify the recall in advance so your item can be sold at the event. Oftentimes, you just need to contact the manufacturer for the Repair Kit. We will not accept any recalled items for sale without the repair kits included - JBF is committed to safety. Check to make sure ALL electronics and toys are working properly. Battery-operated items MUST include working batteries, which can be purchased inexpensively at your local Dollar Store, so that Shoppers can be assured that the item works. We will be inspecting to make sure all battery-operated toys have working batteries during Drop-off so please pack these items together so they are easy to find. Items without batteries will not be able to be included in the sale. Clothing (Newborn to Teen): clean, stain-free, current season only - for our Spring Events, bring items your child would wear between March to September in the Pacific Northwest. For our Fall Events, bring items worn between October to March. Onesies/T-shirts (long/short sleeved), footed PJs, Costumes, Swimsuits, Holiday Clothing & Dance Dresses are accepted all seasons, Girls sizes: Preemie - Juniors Size 13 (Junior Girls clothing are sized using odd numbers only), Boys sizes: Preemie - Teen Size 20. Please read the Drawstring Guidelines. Maternity Clothing: clean, stain-free, name brands and current season sell best. No other women's clothing will be accepted (i.e. clothing sized using even numbers). Baby Care Items: bath tubs, washcloths & bath towels, breast pumps (non-WIC), bottles, bibs, feeding items (such as cups, plates, bowls & utensils), baby food makers/containers or baby food/formula (must be unopened and not expired), sterilizers, warmers, nursing covers, diaper bags, slings & carriers, infant toilets & toilet seats, cloth or disposable diapers, diaper genies, safety items, car seat accessories & toys, booster seats, etc. Large Furniture, Gear & Equipment: car seats, cribs, strollers, travel systems, swings, high chairs, bouncers, walkers, activity centers, play yards, pack-n-plays, play gyms, toddler beds, bunk beds, twin beds, dressers, cribs, mattresses, co-sleepers, changing tables,rocking chairs, gliders, table & chair sets, desks, etc. Kid's Bedding & Room Decor: blankets, sheets, framed art, lamps, etc. NOTE: We will no longer be accepting crib bumpers. Toys & Play Equipment: large/small, indoor/outdoor, riding toys, toy kitchen sets, character toys, stuffed animals (must be new with tags), learning toys, outdoor play sets, trampolines, sports gear, bikes, etc. Toys should be clean and batteries must be included. Family Entertainment: books, music CDs, movies (original DVDs only), video game consoles (Nintendo, Wii, Playstation, Kinect, XBox, etc), puzzles, games, electronics, sporting goods, etc. Batteries must be included. Parent Mart: small kitchen appliances, tools, dining room sets, bedroom furniture, end tables, coffee tables, chairs, bookcases, armoires, hutches, desks, home decor, art supplies including stamping/scrapbook supplies, party supplies, etc. Note: no upholstered items or adult clothing in this section either please. Place multiple items such as toys, rattles, bottles, etc. or small parts/accessories belonging to an item (such as furniture of a doll house or socks/headbands that match an outfit) into a Ziploc bag and tape the opening shut. Fasten the bag securely to the item with clear packing tape, zip ties or ribbon. If all items will not fit into one bag, you may use multiple Ziploc bags then attach them all together with zip ties or ribbon. You can include a duplicate tag in each bag just in case they become separated so they can be matched with their item again. Toys such as games/puzzles must include ALL parts. Similarly sized items such as books, games, DVDs, etc. can also be grouped together using ribbon, yarn or string. Clothes, bags, blankets, slings and carriers sell best when hung on a hanger for Shoppers to see more easily. The hanger should look like a "?" when viewing these items from the front. TIP: No need to use pant hangers for bottoms as you can either ziptie, safety pin or use a tagging gun to hang pants on the shoulder part of a shirt hanger. See examples here. When typing the description of your item, make sure to include the brand name, color/pattern, type of item and number of pieces. This will make it easier for us to match the item to the tag description if they should become separated. For Example: 2pc Gymboree Blue SS T-shirt with Gymboree White/Blue Plaid Shorts. There are no minimum requirements for pricing an item. However, based on market research, we do RECOMMEND that you group smaller valued items together so that the total tagged price can be at least $3 in order to maximize your time and sales. See our current Pricing Guidelines and Creating Tags Tip Sheet and watch the How to Tag video series for more details. Tags must be printed on WHITE CARD STOCK using the 'NORMAL' quality print setting. Colored paper does not scan well at checkout and thin paper will easily tear away from the item. 'Draft/Economy' print quality is too light and 'Best' print quality tends to print barcodes that are too thick for our scanners to read. Also make sure that the printer is set to PORTRAIT setting. If set to LANDSCAPE setting, then the tags will print too small and cannot be read by our scanners. Our templates print 9 tags per sheet. Attach tags to clothing items using either a tagging gun or safety pin. Be sure to attach the tag using the garment's label or the hem at the collar/waistband, especially if using a tagging gun. DO NOT puncture a hole directly into the material. I also suggest taping the tagging gun barb or safety pin directly onto the tag to prevent it from being separated from your items as well. See Tagging Gun Tip Sheet. Tape the tag securely with packing tape onto a flat surface of the item without covering the barcode. NOTE: For books we recommend using blue painter's tape (preferred) to attach tags to books. Packaging, Scotch or Masking tape tends to tear the book cover when removing the tag. Our scanners have a very difficult time scanning the barcode through plastic bags due to the glare. Instead, tape the tag on the outside of a bag with clear packaging tape and without covering the barcode. Let us help! We can help you if you have no time, moving out of state and won't be here for the sale, need to clear out quickly? Let us help prep your items for you! VIP Consignor spaces are limited and will close when all spaces are full and they DO fill quickly! Tagging Guns can be found and purchased inexpensively by doing a search for "Tagging Guns" on Amazon.com. Make sure to select a "fine" needle tagging gun as they create the smallest holes. Tell 10 to CA$H In! Share as many Free Admission Passes as you can to your local social network? Email us at tashajohnson@jbfsale.com with the words "Free Passes" in the subject heading with your home address and how many passes you want and we'll mail them to you! Forward our JBF E-Newsletters, share our Facebook event, or share our Eventbrite Admission Tickets with friends/family and other mommies you meet! Want a Bigger Consignor Check?